Clean, Green, and Lean: Get Rid of the Toxins That Make You Fat is written by Walter Crinnion, a naturopathic doctor who is one of the world’s leading authorities on environmental medicine. In this book Crinnion shows dieters how to clean up their diet and their body so that they can release excess weight and eliminate toxins. He claims that this detoxifying program will help you to overcome chronic health problems such as allergies and fatigue. You will also experience more energy and at the same time help to create a greener planet. Crinnion explains that most diet plans don’t work because they overlook an important factor; our exposure to toxins from the food we eat and our environment. He says that no matter how much you diet or exercise, you will have difficulty losing weight if you have a high level of toxins in your body. Clean, Green, and Lean is designed to help you reduce your toxic burden and this will allow you to naturally let go of unwanted pounds. Crinnion recommends several methods that you can use to Detoxify your body. He encourages the intake of organic foods and gives guidelines as to those fruit and vegetables that you must buy organic as well as those that are not as important. This can help to make it more affordable to eat a diet where pesticide exposure is significantly reduced. He also provides advice about supplements that can assist the body to eliminate heavy metals and other poisons. In addition he recommends the use of colonics and saunas to rapidly aid in detoxifying the body. The information in Clean, Green, and Lean will also help you identify and eliminate toxic substances around your home. It also includes a two-week meal plan with recipes. Organic fruit and vegetables, organic eggs, Alaskan salmon, shrimp, chicken, lean Canadian bacon, turkey breast, chicken breast, tofu, soy milk, low fat cheese, low fat yogurt, corn tortillas, gluten-free bread, brown rice, kidney beans, pinto beans, macadamias, pecans, walnuts, organic butter, olive oil, protein powder, rice bran, green tea. Clean, Green, and Lean claims that you don’t have to exercise to get results on this body detoxifying plan, but that it is best if you do. The author recommends walking to help move the lymph through the body, which assists with the elimination of toxins. 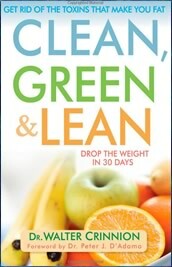 Clean, Green, and Lean: Get Rid of the Toxins That Make You Fat retails at $25.95. Can assist dieters who have not achieved success on conventional weight loss programs. May help with the management of a variety of chronic health issues. Encourages the intake of organic food. Provides information about the varieties of fish with the highest mercury content. Includes inspirational stories from successful dieters. Recommends the intake of a large amount of supplements. Encourages the consumption of soy foods. May be more expensive to buy organic produce. Advocates the use of colonics, which may disrupt electrolyte balance and eliminate healthy intestinal bacteria. Does not provide clear exercise guidelines. Clean, Green and Lean is a 4-week plan to help dieters to eliminate toxins that may be preventing them from losing weight. It will appeal to dieters who have not experienced positive results on conventional weight loss programs as well as those who are interested in adopting a green lifestyle and are interested in detoxifying their bodies.